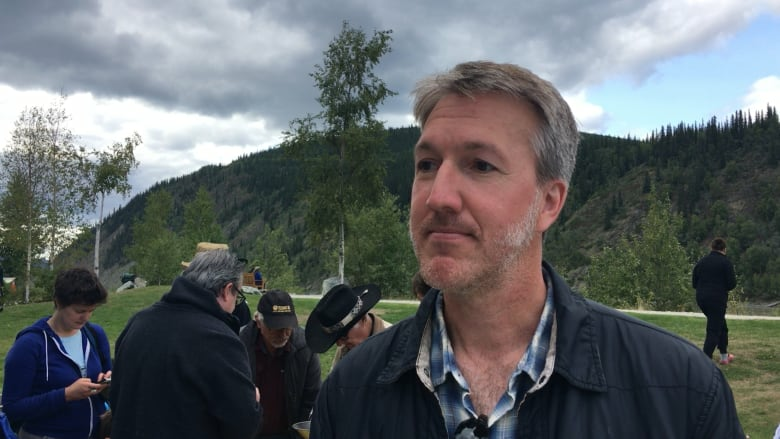 Community leaders in Dawson City, Yukon, cracked open a mysterious safe on Saturday that was found buried under the streets earlier this month. Yukon Premier Sandy Silver and Tr'ondek Hwech'in First Nation Chief Roberta Joseph pried it open with crowbars at the Front Street gazebo after the Discovery Days parade. Old equipment used to measure gold, such as triangular, copper trays used for pouring gold into bags or onto scales, and pieces of wood, were found inside. A local gold prospector brought debris from the bottom of the safe and a piece of cloth down to the river and panned it for gold, discovering tiny flakes of gold. 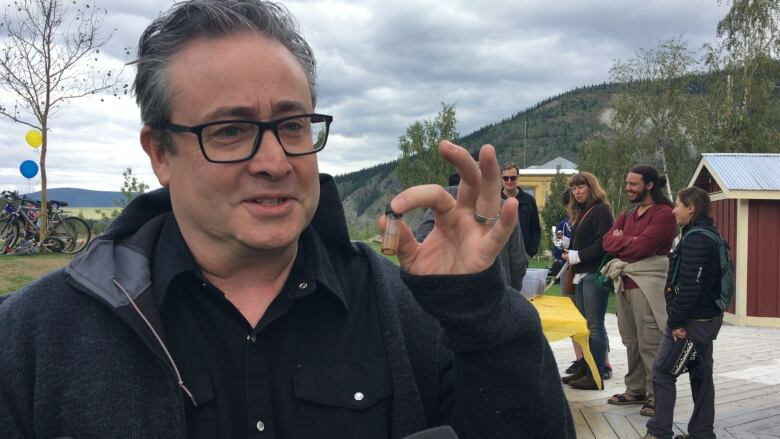 "[I'm] pleased that [the safe] wasn't empty, tickled that there was actually some gold in there," said Dawson City Mayor Wayne Potoroka, who collected the tiny gold flakes in a vial. "I originally thought it was going to be empty." A crowd of more than 100 people gathered for the opening of the mysterious safe. Before people discovered what was inside, they guessed what its contents might be — old documents, photographs, bones, or gold bricks. Construction workers discovered the safe while digging near the intersection of Second Avenue and York Street on Aug. 4. "I think it's fantastic that we can still get excited about our history and some of the interesting things we pull out of the ground," said Potoroka. "That is what Dawson is all about though. It's full of surprises and never fails to perform." The safe and its contents have been taken back to the city's public works office for now. Potoroka said they could be put on display where the safe was found. The Northern Commercial Company store used to be located where the safe was found, according to Yukon archeologist Ty Heffner. Chief Joseph shared with the crowd a story her father told her about the store burning down in the 1950s and the site being bulldozed. "The safe could have been bulldozed into the ground following that fire," said Heffner. The safe could date as far back as the 1900s and could have been used a few decades before that, he added. "We don't leave empty handed," said Heffner. "There is some evidence the safe was used and it was used for storing gold."